Chateaux descriptions vary considerably as does the spelling in search requests: Chateaux in France, French Chateaux Chateaux [plural], Chateaux France Hotel, Chateaux [the plural form] and Chateau [singular form], this Châteaux [with circonflexe - the accent mark over the â] French castles, France Castles, Châteaux de la Loire, Loire Valley Chateaux, and French Medieval Castles, medieval chateaux France, Luxury chateaux to rent in France, Charming chateaux to rent France, Castles of France, France golf chateaux, prestigious castle rentals France, the list goes on and on. Now you can . . . . . DISCOVER THE ROYAL & OTHER NOTED CHATEAUX AROUND FRANCE. 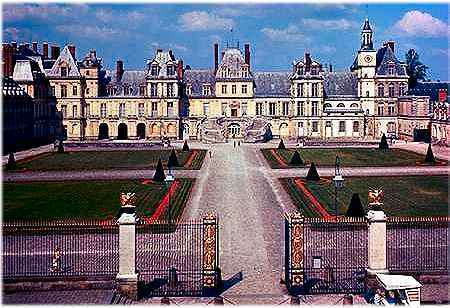 The Châteaux in France are magnificent and architecturally gratifying. The best source for information on France's historical castles and museums, monuments and landmarks can be found here. There are several thousand chateaux of historical and architectural significance throughout France. Discover what Chateau means! On this page you'll find les Chateaux de la Loire as well as some of the more noted national [Royal] and privately owned historical and medieval French châteaux. There are the magnificent and historical walled cities, abbeys, cathedrals, châteaux housed B&Bs, and of course tours to visit these spectacular monuments. Some châteaux included in the Chateaux Pass, the Royal Chateau de Chambord, and Chateau d'Angers that dates back to the first century, truly a medieval castle. And please visit our information on Le Notre the famous landscape designer for these magnificent chateaux and their gardens. The term landscape architect hadn't been created yet, he was advanced way beyond his time, for the illusions and plans devised in his time. The Chateau of Chambord shown at left is the largest of the Royal Chateaux in the Loire Valley. The tours that are offered include some of the most magnificent of the castles in the Loire. View all the top Loire Valley Tours & Packages for the Loire Valley, that encompass the two regions of Centre [Central Loire Valley] and Pays-de-la-Loire [Western Loire Valley]. Relive history; visit these awesome castles from the 12th - 18th centuries. Find additional castle information, such as the parts of a castle and what they're called, and pictures of castles from various castle websites and castles from the middle ages. Enjoy our 'Chateaux' pages, and these truly beautiful and magnificent Royal and Private Castles of France! . The Loire Valley traverses two French regions. Centre [Region 6] and Pays de la Loire [Region 18]. The Loire Valley is also known as Chateaux de la Loire. What is a Chateau? Wherever the Romans established themselves they fortified their cities by building a wall around them for protection from their enemies. Chateau Angers and Photos of the chateau. A panoramic view of the chateau and surrounding community of Angers. Angers is a very impressive architecturally, as well as aesthetically, the governments site on Monuments and 'Le Chateau d'Angers'. From Wikipedia - Chateau Angers, a good information site! Chateau Azay-le-Rideau and Photos of the chateau. The official website for Azay-le-Rideau. This chateau is one of the more favorite and beautiful ones, with some great photos. Wikipedia's information on the beautiful Azay-le-Rideau on the Indre River. Chateau Blois boasts classic renaissance architecture and . 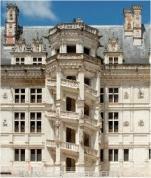 . . architecture of Chateau Blois and additions. Wikipedia on The Chateau de Blois with some architectural and historical information. This photo of the spiral staircase shows the truly amazing & elaborate renaissance designs that this chateau is known for. There are many different architectural styles as they added on to the chateau. Catherine de Medici occupied Blois at the end of the 16th century. Chateau Blois Garden Visit with some great photos. Again, the architecture and the gardens of Blois is truly magnificent! This is one of the most visited & beautiful Château in France, it is truly amazing and not to be missed in touring the Loire Valley. With it's double staircase inside the castle where men could ride the horses up and down the two stairs without seeing each other! With just a mere 440 rooms, and 365 chimneys this is where the Royalty spent a few weekends a year to hunt! Another Chambord site with lots of photos. Chantilly Lace made famous by Elvis's song, is the silk lace dating from the 18th century. The Château de Chaumont in 1560 became the property of Catherine de Medici [another chateau for Catherine] who in turn forced Diane de Portiers to exchange Chaumont for Chenonceaux.after King Henri II's death. Wikipedia's information on Chaumont, a beautiful fairytale castle. I believe it's unanimous, this is the most beautiful of the Loire Valley Châteaux, Château de Chenonceaux. The chateau was used during WW I as a hospital, it's owner at the time was Mr. Gaston Menier who did this at his own expense. This château was given to Diane de Poitiers by by King Henri II [she was his lady on the side] and then Catherine de Médici took it over. Her influence on the Château, as well as several of the other chateaux of royalty, was truly spectacular. This is one you do not want to miss on your tour through the Loire Valley. Chenonceaux is privately owned, and truly wonderful to visit. The stories of the goings on of the Royalty were truly 'Royal' soap-operas. Château-Cheverny, this is a privately owned chateau, and has been lived in by the descendants of the Hurault family [marquis de Vibraye] for over 6 centuries. The annual marathon [ASJ Athletisme] at Cheverny. Le Chateau de Fontainebleau This is a non-official Fontainebleau site, but has a great deal of information on the history and all facets of Fontainebleau. The click on virtual panoramic visit to the chateau and gardens, c'est magnifique! Château d'Usse, in the Indre Valley, was originally a fortress from the 11th century. After the main part of the building was destroyed, the château was rebuilt during the late 15th into the 16th century. The château was added onto through the centuries, turning it into the fairytale castle of today. Charles Perrault bought Usse [the chateau of dreams] in the 17th century, and supposedly was inspired to write the classic 'Sleeping Beauty' [and all of his other fairy tales]. This is 'The Castle of Sleeping Beauty' fame, and some of the decor inside reflects the fable. A nice information site on Usse, however rumor has it that Disney used Mad Ludwig's favorite castle Neuschwanstein [photo] that sits on top of a mountain over looking a lake as inspiration for Cinderella's Castle. Photos of the Château take by YOU! Andre le Notre [André le Nôtre], designed the gardens of Vaux-le-Vicomte, then on the Versailles and the list goes on....Andre Le Norte was the supreme landscape architect [before the the term landscape architect was conceived in 1828] of châteaux gardens. The park and gardens of Versaille just beautiful, a great site! The Château de Villandry is known for it's magnificent gardens. The Chateau underwent major reconstruction, and is more magnificent then before, and the gardens are some of the most noted in France and the world. The village of Villandry and it's tourism information with events and happenings. La Passion des Chateaux is dedicated to historical chateaux around France, but primarily focuses on the Puy-de-Dome area of Auvergne. From the evolution of the chateau, architectural terms for the different parts of a chateau, as well as the Coat of Arms explanations and much more. You can view the chateaux here. For Fondation information, click on this page, et La Protection des Monuments Historiques links click here. For information regarding Restoration, you find the information here. An individuals website on castles. These châteaux are not as well known to visitors, and the site is not exclusive to French chateaux, you'll get to view the other countries castles if you like. However, the photos and information is great! Castleland Regional Map of Medieval Châteaux and Directory by Department, this is a great site with all the contact information as well as links to many of the châteaux associations. Castles of the world - [huge portal] contains a large collection of castle related information for France and around the world. Loire Valley Tours website, the virtual visit. Start at Amboise and click on next monument below each château, it will take you alphabetically through all the major châteaux of the Loire Valley. We've already put some of the chateaux on this page, but take a trip to see the rest. Really nice!. The grandest walled city of them all is Carcassonne [ancient medieval city]. A Unesco World Heritage site. A nice information site on Carcassonne, and very impressive night photo of it. Offiical Tourism site for Chinon - Chinon was included in the French royal estates in 1205, this is a very nice site! Be sure and go through the links. Château de Chinon, the Medieval Fortress in the Loire Valley, and where Charles VII first met Joan of Arc. With photos and a lot of historical information. Chateaux listings in Switzerland link.